When Turbo came to theaters in 2013, it wasn’t exactly seen as a success. Although far from being the bomb that some in the press tried to make it out to be, it couldn’t hold its own during what proved to be a very competitive summer movie season for family audiences, going against films like Monsters University, Despicable Me 2 and The Smurfs 2. With a domestic take of about $83 million, it looked like the series was one and done, with any hope that DreamWorks Animation had of making it into a franchise burning up faster than a snail under a salt shaker. 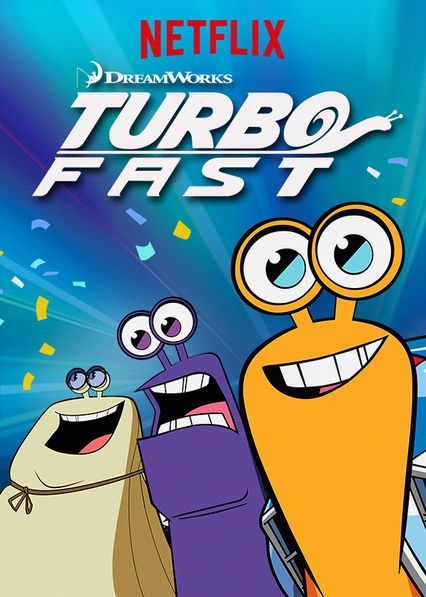 But the studio was so confident that Turbo would be a hit that a TV series was already in the works for Netflix before the film was even released, premiering exclusively on their streaming service during the holiday season of that year. While official “ratings” for the show are unavailable as Netflix never reveals those to the public, the series was apparently a big enough hit for them to order a second season, ultimately making Turbo something of an unlikely hero for DreamWorks during their last few years of various financial problems. 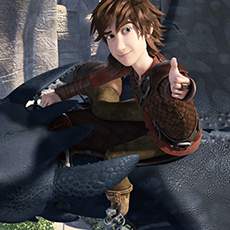 The smartest decision made by the studio was to produce the series in traditional animation. Visually setting it apart from the movie on which it’s based, Turbo: F.A.S.T. is bright, colorful, and full of energy. Right from the start with the show’s insanely catchy theme song, it looks and feels like a Saturday morning cartoon. Yes, I know that educational programming has its place in children’s television, but as I said in my review of Uncle Grandpa earlier this year, sometimes it’s nice to have a series that isn’t worried about teaching its intended audience a lesson. Occasionally it’s nice to have a show that simply just wants to have fun. And, going by the two screener episodes we were given to review, Turbo F.A.S.T. is quite fun. 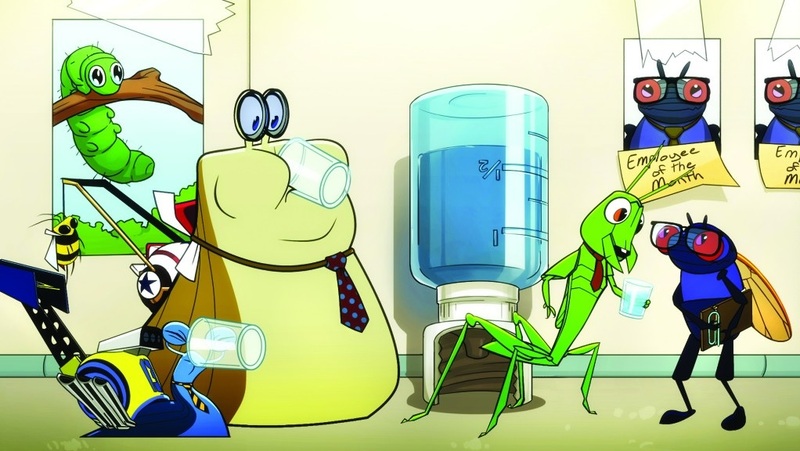 The series is fast-paced and energetic, offering lots of comedy for kids while still following the DreamWorks tradition of having plenty of jokes for adults. It may not deliver quite as many laughs as you might like, but at 11 minutes an installment, the show is never allowed to outstay its welcome. If one gag doesn’t do it for you, then another will come along that will probably bring a grin to your face. One secret to the show’s success? Finding ways in which to make comedy involving snails with car engines attached to their butts relatable. In the first of the two episodes we were given, Home on Our Own, Skidmark and White Shadow trap themselves in their garage in order to binge watch Gossip Snail, a TV drama they are both obsessed with. At first, I was tempted to roll my eyes at the suspicious Snailflix gag in a show that’s only available on Netflix, but then the plot got to its central theme: Skidmark and White Shadow are only doing this is because they are terrified of having Gossip Snail’s secret identity spoiled for them. And as anyone who’s ever been into a TV show will tell you, there are few things harder to avoid–or more frustrating–than spoilers. And whether you’re at work or just scrolling around on Facebook, there is truly no where that you are safe from them. The way that Skidmark and White Shadow scream the word “Spoiler!! !” out of pure horror anytime someone’s about to reveal a show’s twist to them will be enough to make kids giggle. But speaking as someone who’s still an entire season behind on Game of Thrones because he doesn’t get HBO, their reactions honestly aren’t that far off. 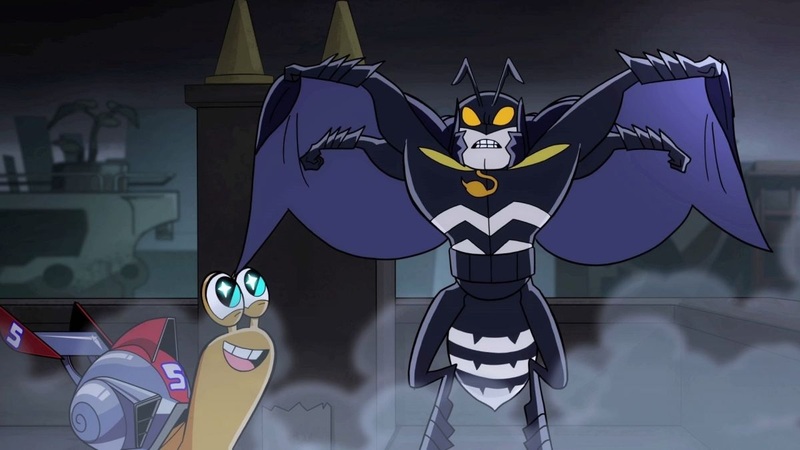 In the second episode we were given, The Sting of Injustice, Turbo gets recruited to become the sidekick of “The Stinger,” a vigilante hornet who seeks justice while also wanting a place to crash. On the surface, this may just seem like an obvious parody of Batman, but it’s made into so much more than that by who they get to voice the character: Batman: The Animated Series’ Kevin Conroy. For many, Conroy’s Batman may be the most “iconic” version of the character, so to hear him voice “The Stinger” with the exact same self-seriousness makes everything about the episode more hilarious, and it’s made even better by the overly dramatic lines he’s given to read (“The twisted pretzel of justice can never broken, nor will it ever be salted, or dipped into honey mustard.”). Of course, “The Stinger” ends up being an obnoxious egomaniac, although some of the “injustices” he goes after–including the price of movie theater popcorn–are arguably justifiable things to be upset about. Even if you never plan on watching another episode of Turbo: F.A.S.T., if you’re a Batman fan, I would recommend seeking this one out just for the presence of Conroy alone. It’s hard to judge an entire TV show based off of two episodes alone, but from what I saw, Turbo: F.A.S.T. is surprisingly entertaining. In fact, it might even be more enjoyable than the movie (which I liked, but still find myself referring to as “2013’s better version of Planes“). 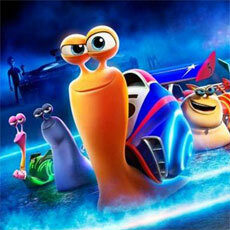 With zippy plots and a genuine sense of fun, these snails should be fast enough to please both kids and adults.